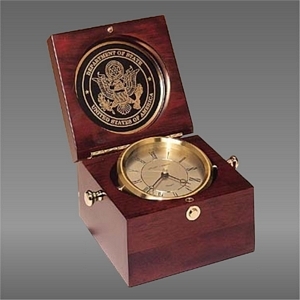 CLK73 CAPTAINS CLOCK IN MAHOGANY FINISHED CASE WITH SOLID BRASS HOUSING . QUARTZ MOVEMENT, LIFETIME GUARANTEE AND BLACK BRASS ENGRAVING PLATE. THE BATTERIES ARE INCLUDED.